Washington, D.C. – In the wake of WikiLeaks’ release of emails revealing collusion by the Democratic National Committee (DNC) and the Hillary Clinton presidential campaign to defeat the insurgent candidacy of Bernie Sanders, the Clinton camp diligently spun a now leading narrative. 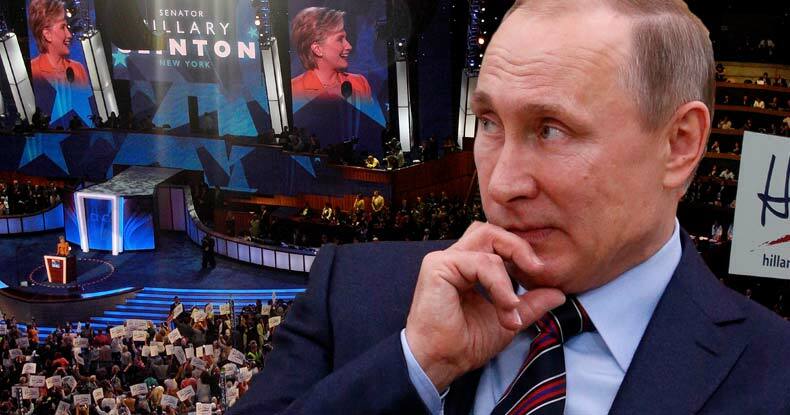 This narrative – regurgitated by the mainstream U.S. media – is that Russia’s Vladimir Putin is actively working to subvert the U.S. presidential election. Interestingly, Russian President Vladimir Putin preemptively addressed allegations of Russian interference in U.S. elections, and in turn, questioned the legitimacy of U.S. democracy during a panel discussion at the St Petersburg Economic Forum. Putin was joined onstage by scholar, author and CNN foreign affairs correspondent, Fareed Zakaria, as well as Kazakhstan President, Nursultan Nazarbayev and by 41-year-old Italian Prime Minister, Matteo Renzi. CNN’s Zakaria is a renowned leftist-globalist, as well as a member of the Council of Foreign Relations, and is known for his work as author of, ‘The Post-American World.’ He is considered gifted minded in many political circles but is the virtual embodiment of Western globalism underpinned by U.S. hegemonic imperialism. After seeing Putin’s response to Zakaria’s disingenuous question it becomes crystal clear why U.S. mainstream media doesn’t often show Putin. His penchant for direct, honest, rational discourse clearly refutes the constant droning on by paid corporate media talking heads attempting to paint Putin as some aggressive and irrational nut. Hillary has gone so far as to equate Putin with Adolf Hitler, which flies in the face of reality. In fact, Putin strikes directly at the heart of the American government’s legitimacy to rule in his response to Zakaria’s question. Putin: (To Zakaria) “Well, well — You’re a very famous person in our country, you personally. Not only as a host on a major media corporation, but also as an academic. So, why are you juggling with what I said? Your ‘journo’ side is prevailing over your ‘analyst’ side. Let’s examine what I actually said. “I said in passing, that; Trump is a colorful candidate. Do you not find him to be so? I do. “We, however, do not interfere in to the internal political processes of other countries, especially the U.S.! We will work with whatever individual that the American people vote for. As a side note, America teaches everybody else, how to live with their lessons in “Democracy” – but do you actually believe the US elections are democratic? Twice in US history was a President elected that had the most votes from super-delegates, backed by the least amount of voters. Is that your Democracy? “And when we try to discuss this with our (US) colleagues – key word is ‘discuss’, not criticize – they say, ‘This is how we do it and mind your own business’. Then, how come you interfere in our business? Sort out your own issues first. “I agree that the US election really isn’t our business – despite the fact that there are reports of prosecuting attorneys shooing away international observers from US polling stations. But these are your own internal issues to sort out. “The US is a superpower, and possibly the only superpower of today. We accept this. We would like to cooperate with the US. No matter how the elections go, there will be a new head of state with great powers. The US is undergoing internal political and economic changes. The world needs a strong superpower. We need it too. What we don’t need is their constant interference in our business, telling us how we should live, and getting in the way of Europe building their relations with us. “The sanctions that you mentioned, do they affect the US? No, not at all, you couldn’t care less about them. Our reactionary measures in response to Europe’s sanctions do not affect the US, at all. Who do they affect? Europe! (To Italian Prime Minister Matteo Renzi [Italy’s economy has suffered a large blow by not being allowed to export agricultural products to Russia]) “Matteo, why should you ‘hang in there?’ Please explain. He’s a great orator, as we have just seen. I mean it – Italy has a lot to be proud of!